$11.95 (save $2.00). Once it sells, it's gone. We do not expect to restock. With their 2007 album, the combined unit of Lazerus, Argonaut & Elon have come a long way since the somewhat obscure Robot Dreams in 2005. 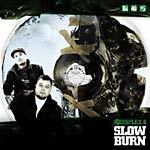 On Slow Burn, they proficiently expand on previous efforts with a focus more on the cohesion of songs and mood, specifically a flair for melodic samples and score-like sensibilities. Lazerus and Argonaut's lyrics reflect on the woes of today and their own personal issues with a maturity only achieved through the test of time, directly related to the fact that the group has spent the last three years working on Slow Burn. D6 has definitely created an album worth the wait and gives insight to what we hope will continue with their future releases. Track 1 Produced by Jason The Argonaut and Elon.is. Tracks 3-9 and 11 Produced by Jason the Argonaut with additional Production on Track 5 by Elon.is. Tracks 2, 12, 14 and 15 Produced by Elon.is. Track 10 Produced by Mercury. Cuts on Tracks 4 and 9 by DJ Capsize. Additional vocals on Track 2 by Ehnertia.